First of all, I updated the GT40 diary on my site for the first time in a long while! Something modifications to the front nose seem successful and I began to trim the bonnet. I added center division plate into the air outlet, for example. The yellow mush you can see above photo is epoxy filler. 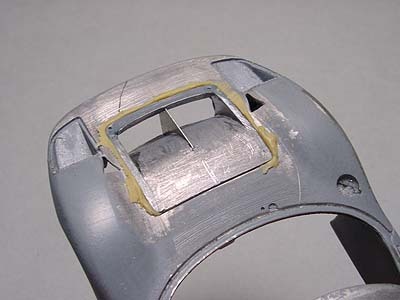 I couldn't tolerate such a loose gap between the bonnet and the body, so I've caulked it with the filler. The re-engraving would be annoying but I like elaborate workmanship!